"This wondrous tale is brilliantly matched by Lynch's elegant yet accessible watercolors. . . .The best edition now available. Bravo!" —KIRKUS REVIEWS (pointered review) A beloved Norwegian folktale, EAST O' THE SUN AND WEST O' THE MOON is the romantic story of a bewitched prince and the determined lassie who loves him. It has everything a classic epic tale should have: rag "This wondrous tale is brilliantly matched by Lynch's elegant yet accessible watercolors. . . .The best edition now available. Bravo!" 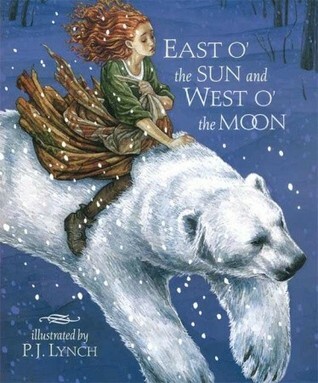 —KIRKUS REVIEWS (pointered review) A beloved Norwegian folktale, EAST O' THE SUN AND WEST O' THE MOON is the romantic story of a bewitched prince and the determined lassie who loves him. It has everything a classic epic tale should have: rags and riches, hags and heroism, magic and mystery, a curse and a quest, wicked trolls, a shape-shifting bear, and finally, a happy ending. Kate Greenaway Medalist P.J. Lynch has created a luminous backdrop worthy of this grand adventure, transporting readers to a world of fantasy and imagination.